Suitable for vegetarians our Calamine (Fragrance Free) soap has been handmade using premium vegetable oils, cocoa butter and shea butter. The added zinc oxide and red oxide are two main ingredients in Calamine Lotion, the inspiration for this soap. Suitable for vegetarians our Calamine (Fragrance Free) soap has been handmade using premium vegetable oils, cocoa butter, shea butter, zinc oxide, red oxide & Kaolin Clay. It’s the zinc and red oxides that make this soap a calamine inspired product. We have cured each bar for at least 6 weeks. 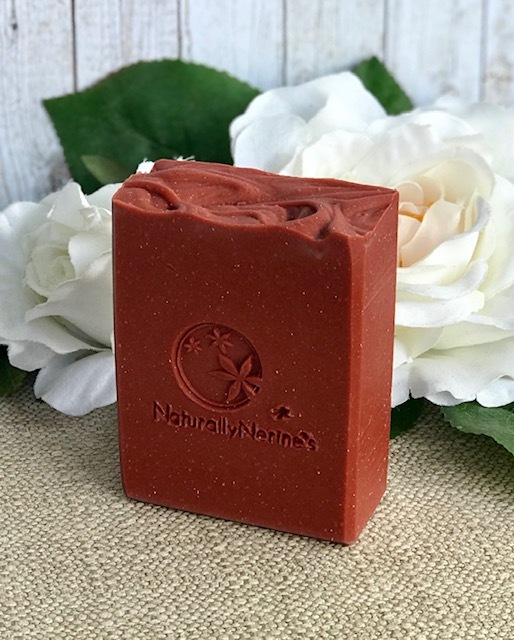 A major benefit to our longer than normal cure is that Naturally Nerine’s Calamine (Fragrance Free) Handmade Soap produces a gentle, smooth and long lasting bar that has a bubbly lather when used. Weighing 140 grams, each soap comes individually packaged in clear shrink wrap and labelled. Ingredients: Water, Sodium Hydroxide, Coconut Oil, Olive Oil, Soybean Oil, Sustainable Palm Oil, Cocoa Butter, Shea Butter, Zinc Oxide, Red Oxide, Sodium Chloride & Tussah Silk.